George Blodwell, stylist to some of the biggest stars and oft-contributing style editor to Genlux magazine, stopped by the Beverly store to say 'hello', and raved about his fashionable Peace Monocle. These Italian plastic made beauties, now a staple of his look, have become a must-wear for George, and no look of his is complete without it! 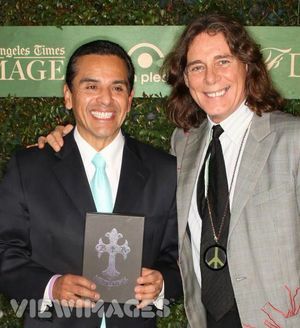 Check George out in the photo above with Los Angeles' Mayor Villaraigosa. You'll notice his fantastic Peace Monocle in black with green stripes! Like we always say around here, "Magnify your reading material, and magnify the message"!